1) Reliable recession warning signals are not flashing. 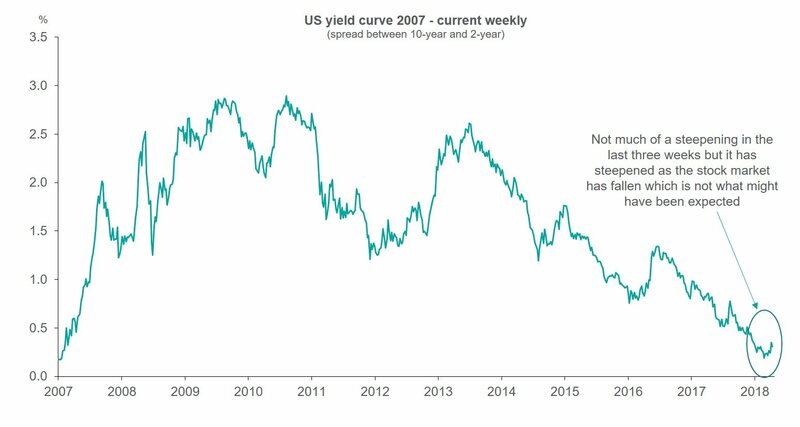 Indeed one of them, the US yield curve, is steeper than it was before the stock market correction. It hasn’t steepened much, but it has steepened. 2) In the space of a month the prevailing mood appears to have gone from “the yield curve is going to invert which means a recession” to “bond yields are rising which means equities are unattractive”. It is true that the bond yield is now, on some technicians’ charts, above the upper channel of the downward trend line since 1981. But are bonds now attractive relative to equities in the United States? The chart below is a version (there are at least 20 recognised in academia) of the “Equity Risk Premium” (ERP). This takes the current dividend yield on the S&P500 (1.85% at the end of September), adds a presumed growth rate in those dividends (currently 4.25%) and then deducts the 10-year Treasury yield (3.06% at the end of September). On this basis, the current ERP is 3.0% – still higher than it was pre 2008, but approaching a more “normal” level. 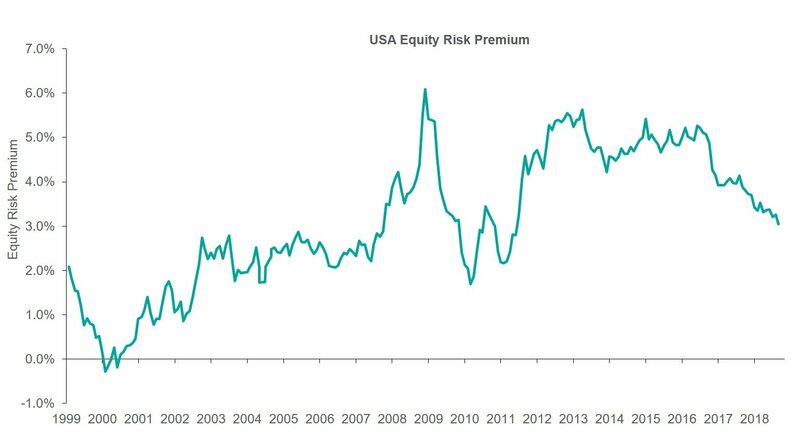 To a US investor, therefore, equities are still attractive relative to bonds but that relative value has come down since mid-2016 when the bond yield bottomed at 1.36% and the ERP was 5%. 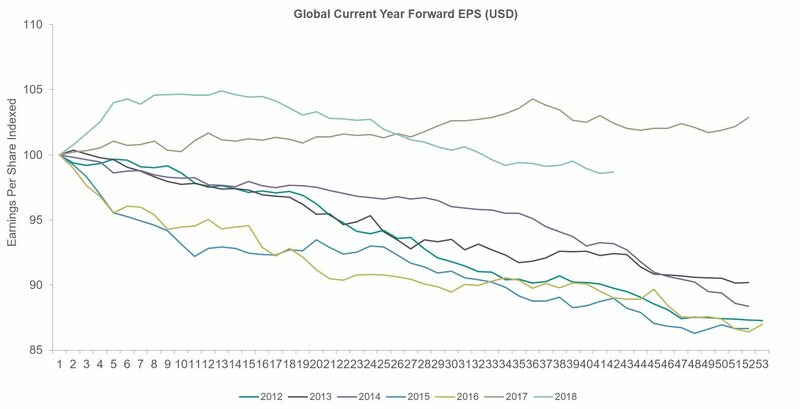 3) Earnings per share (EPS) expectations at the global aggregate level are not yet falling any more than they normally do over the course of a year. The Factset derived consensus estimate series that we look at each week has drifted lower by about 5% since the post-tax-cut peak at the end of Q1. The chart below shows the evolution of the 2018 estimate (light green line, second from top) compared to the evolution of annual estimates for each year since 2012. 2017 was exceptional in seeing estimates rise. In every other year estimates declined. So 2018 is not as good as 2017 but hardly exceptional. Year-on-year global EPS are still expected to be up 11% this year (and 10% next year). 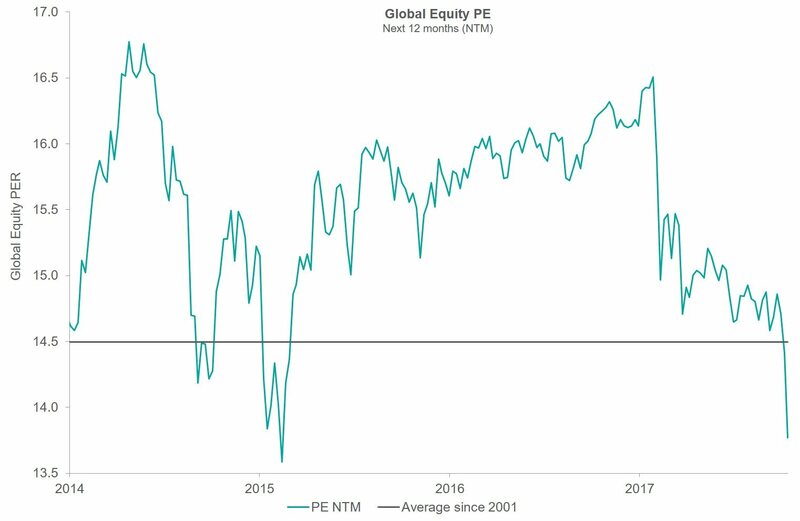 4) The recent decline in the market is greater than the decline in earnings forecasts so the global equity market forward price / earnings ratio (PE) has come down quite appreciably, as the chart below shows. Indeed, it is below the seventeen-year average multiple for the first time since 2015. 5) As we are sceptical that a recession is imminent, the other cause of major problems for markets would be surging inflation and a perception that central banks are “behind the curve”. But there is little evidence of that either. 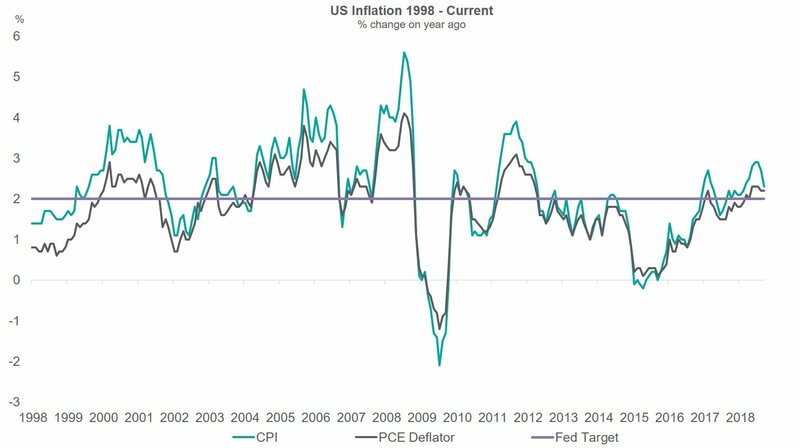 The chart above shows inflation as measured by CPI and the Fed’s historically favoured measure, the Personal Consumption Expenditure Deflator, which is a broader measure of consumer inflation. Both are slightly above the Fed’s 2% target – but the fact that they have been so for most of the last two years is a good thing! It is a sign the threat of deflation is ending, exactly what everyone knows the Fed has been trying to achieve since 2008. This will remain welcome as long as it doesn’t start rising significantly from here, something that seems rather unlikely (noting Sears’ recent filing for Chapter 11 bankruptcy). 6) Inflation being evident, but under control, is why central banks at an aggregate level (taking the US, UK, ECB and BoJ) can run a monetary policy that sets real interest rates at significantly negative levels in real terms. The chart below, as used in our October edition of Market Perspectives, takes into account the impact of Quantitative Easing (now Quantitative Tightening in the US) and adjusts policy rates for that policy. 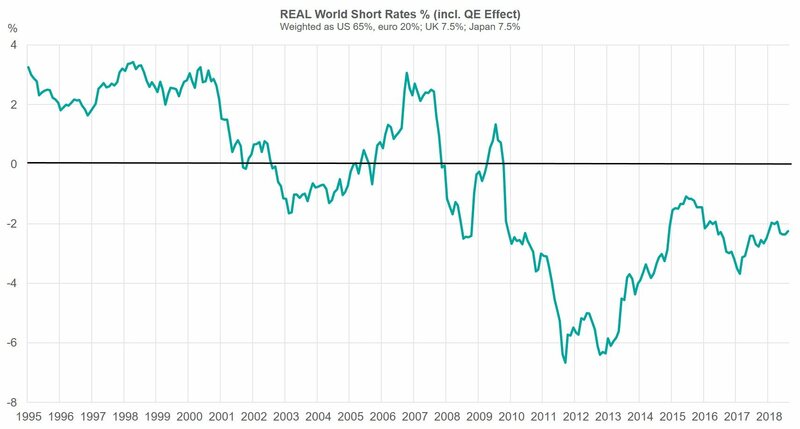 It then deducts local CPI and weightings as shown to derive a “world real short interest rate”. The direction of travel of the green line is likely upward but, at a global level, we think developed world monetary policy remains stimulatory. That brings us back to where we started. Yes, interest rates in the developed world are likely to be heading higher but they are doing so from very low levels and are a long way from being a threat to an economic and profit cycle which still looks expansionary. Politics could disrupt all this, of course, but tariff policies, for example, still seem likely to be muted in their impact at the global level, even if they may well be very disruptive for some industries and companies. Therefore, for now, we suspect this is a sentiment driven correction rather than a full scale assault on the constructive narrative for equities.